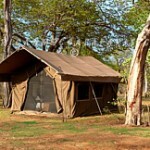 Chobe Under Canvas is positioned at exclusive semi-permanent campsites on or near the Chobe River where well-used animal trails meander between six en-suite safari tents and down to the water’s edge. 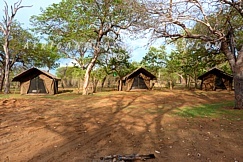 Booked on a nightly basis, each comfortable tent has a double bed, as well as an en-suite bathroom, separate w.c. and steaming hot bucket shower. Guests share their experiences over a pre-dinner drink in the lamplight of the comfortable guest areas. Delicious home-cooked meals are enjoyed around a blazing fire. 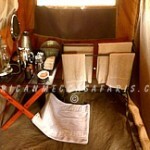 Chobe Under Canvas is closed annually in January and February. 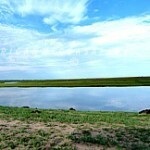 Declared a National Park in 1967, Chobe was the first National Park in Botswana. 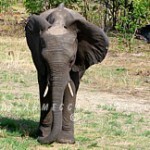 It is home to one of the largest concentrations of elephant on the African continent. Surrounded by wildlife management areas and reserves that allow game to roam freely, the 11 700 km² (4 500 square mile) reserve is located in the far north of Botswana, bordering on the Chobe River. 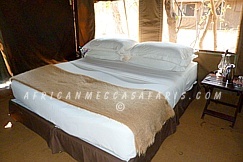 Home to the entire Big Five, Chobe is particularly well known for its large herds of elephant and buffalo, as well as the two antelope that cannot be encountered anywhere else in Botswana, the puku and the Chobe bushbuck. 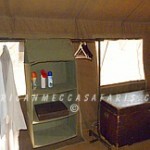 Chobe offers both dry savanna and permanent swamp, in addition to the vast floodplains along the river. Dense teak woodland provides thick cover in the northeast parts of the reserve.The burgeoning elephant population has been responsible for removing the riverine forest that formerly fringed the Chobe, opening up this habitat for other herbivores and the carnivores that prey on them. Watching the elephant families drink and bathe in the river is an unforgettable sight, all the more impressive when herds of buffalo, rafts of hippo and gigantic Nile crocodiles are part of the scene. Lion and spotted hyena are frequently seen on the floodplains, where red lechwe, puku, zebra, sable and roan come out to graze. Renowned as one of the top wilderness reserves in the world, Chobe National Park is home to the largest concentration of elephant on the African continent. 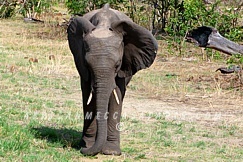 The vast elephant population has had a significant impact on the park, thinning out the dense riverine thickets on the banks of the Chobe River. The huge bulk of these majestic animals requires almost 150 kg of fodder each day, with grass, leaves or even tree branches making up their diet. Elephant herds rely upon their matriarch to lead them to the best feeding and water sites, with individuals seldom straying from each other and ready to come to the aid of a family member who is in trouble.Renowned as one of the top wilderness reserves in the world, Chobe National Park is home to the largest concentration of elephant on the African continent. 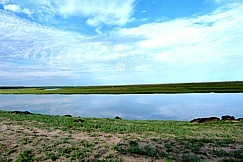 The vast elephant population has had a significant impact on the park, thinning out the dense riverine thickets on the banks of the Chobe River. 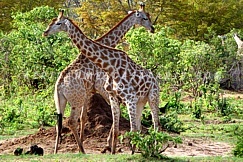 The h uge bulk of these majestic animals requires almost 150 kg of fodder each day, with grass, leaves or even tree branches making up their diet. Elephant herds rely upon their matriarch to lead them to the best feeding and water sites, with individuals seldom straying from each other and ready to come to the aid of a family member who is in trouble. Chobe also boasts two antelopes rarely encountered elsewhere in Botswana – the puku and the Chobe bushbuck. The puku, with their shaggy orange-brown coats and V-shaped horns, can be spotted grazing the floodplains. Always on the lookout for predators, a repetitive whistle is used to warn fellow herd members. 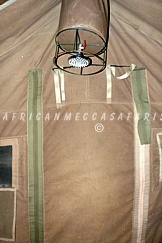 In contrast, the Chobe bushbuck is nocturnal and rarely forms groups of more than one pair. Rarely seen, this shy antelope, with its short, spiral horns relies on a sharp bark as an alarm call when threatened. Both the puku and the bushbuck have a number of predators to contend with, from lion, hyena and leopard, to African wild dog, civet and caracal. 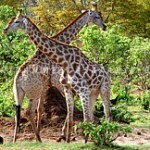 With an incredible wealth of species, Chobe is a haven for birding enthusiasts. Striking colonies of carmine bee-eaters build their nests in the exposed sandy banks of the river. Water birds, including many species of duck and the rare red-billed pratincole can be spotted in their thousands, and guinea fowl and francolin dart through the grasses on the river’s edge. 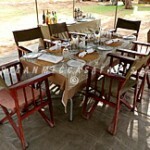 A quintessential African sound, the haunting call of the fish eagle can often be heard echoing over the Chobe River. With their striking chestnut and white colors, these intensely territorial birds challenge competitors to regular calling duets. Twice daily game drives – explore the lush banks of the Chobe River and beyond in an open 4×4 safari vehicle accompanied by an armed guide and tracker. 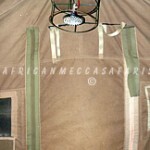 Game drives are conducted in the early morning and late afternoon/evening to avoid the heat of the day. The tracker will constantly search for any sign of animals, while the guide will share his vast knowledge of Botswana’s landscape and wildlife. Boat cruise – a leisurely cruise along the Chobe River at sunset gives guests the opportunity to spot wildlife coming down to the water to drink. Large herds of elephant drinking and bathing in the river are joined by groups of buffalo, while red lechwe, puku, zebra, sable and roan antelope can be spotted grazing on the floodplains. Prolific birdlife can be encountered along the river’s edge, where carmine bee-eaters build massive colonies in the exposed sandbanks. 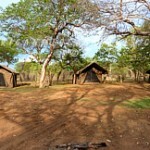 Chobe Under Canvas introduces guests to the natural wilderness highlights of Chobe National Park. 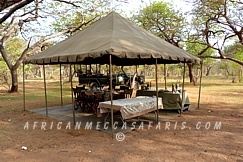 This Park encompasses 11700 km2 of wilderness, bordered in the north by the beautiful Chobe River, and buffered on all sides by wildlife management areas and forest reserves allowing for the free movement of game. A wildlife enthusiast’s dream, Chobe National Park is one of the top wilderness reserves in the world and is home to the largest single concentration of elephant. 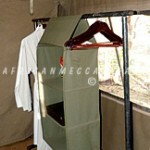 As per National Park vehicle restrictions, it is not possible for guests to self-drive into our Chobe Under Canvas camps. 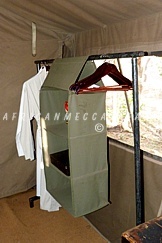 There are scheduled flights to Kasane airport, where a guide will collect guests and transfer them to camp (1 hour with game viewing en route). 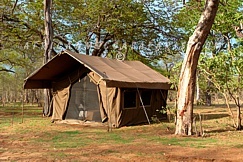 Spacious, comfortable mobile tents, each with twin or double bed, en-suite bathroom, flush w.c., and al fresco bucket shower (hot water delivered upon request). 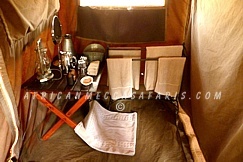 The guest areas comprise comfortable tents for dining, meeting for a pre-dinner drink, or just for whiling the time away between safaris with a good book and frosted beer or glass of Sauvignon Blanc. 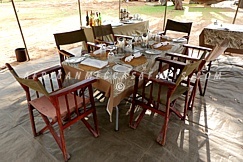 Complete with welcoming camp staff, delicious traditional bush dinners are served under the stars. 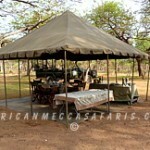 Morning and afternoon game drives and boat cruises along the Chobe River. 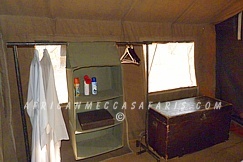 Semi-open 4×4 safari vehicles with guaranteed window seats and uninterrupted views. 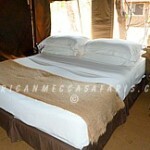 Chobe Under Canvas is regrettably not suitable for children younger than 12 years.